My goodness, are there a bunch of salty Cowboys in Stillwater right now. 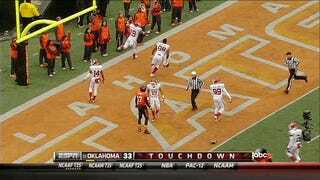 This is an Oklahoma State cheerleader attempting to trip Erik Striker after the final play of the game. Following that, fans began throwing snowballs at the players. Here's the final moments of the game. Oklahoma scores on the final play of the game to win 33-24—a remarkable backdoor cover of the 56.5 or 57 over/under at most sportsbooks—on a botched OSU lateral. Striker recovers the ball on the four-yard line and walks it into the endzone where he is promptly levelled. He gets up, runs toward the back corner of the endzone (almost tripped along the way) and starts celebrating as the snowballs rain down.